This photo of the fresh stock of beach chairs at Brooklyn Beach Shop on the Coney Island Boardwalk was taken in March but the stretch of cold weather kept us from posting it sooner. At last, the forecast is glorious–mostly sunny and in the mid-60s for Sunday, Monday, Tuesday… Perfect weather to plant your chair on Coney Island beach for the first time this season. ATZ recommends the chair with the canopy in the top right of the photo. We own a similar one. 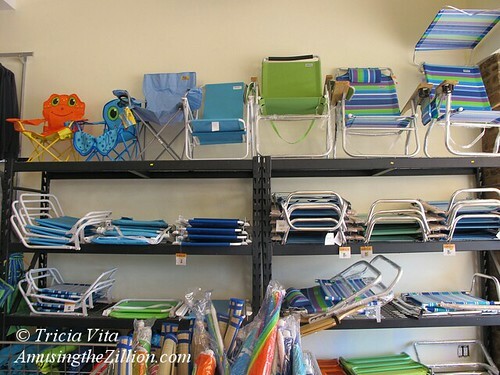 Beach Shop owner Maya Haddad Miller calls it “The Brighton Chair” because it’s a favorite of customers from Brighton Beach. Love this photo, Tricia. So many fine options for beachfront relaxing. What a great feel good picture!!! Looking forward to the new season – so proud of those who worked so hard to overcome so much.